Divide the dough mixture in half; add the cocoa powder to one of the portions of dough and stir until fully incorporated to make the cocoa wafer dough. Wrap each piece of dough in plastic, flatten into a disc, and refrigerate for 30 minutes to 1 hour, until firm but not rock-solid. To roll and form the cookies, divide both the vanilla and chocolate doughs into three equal pieces. Take one piece of each flavor, set them side-by-side on a lightly floured surface, and press them against one another. Lay a piece of parchment paper over the dough and roll out to 1/4-inch thickness, forming one solid piece of cookie dough with one flavor on the left and the other flavor on the right. 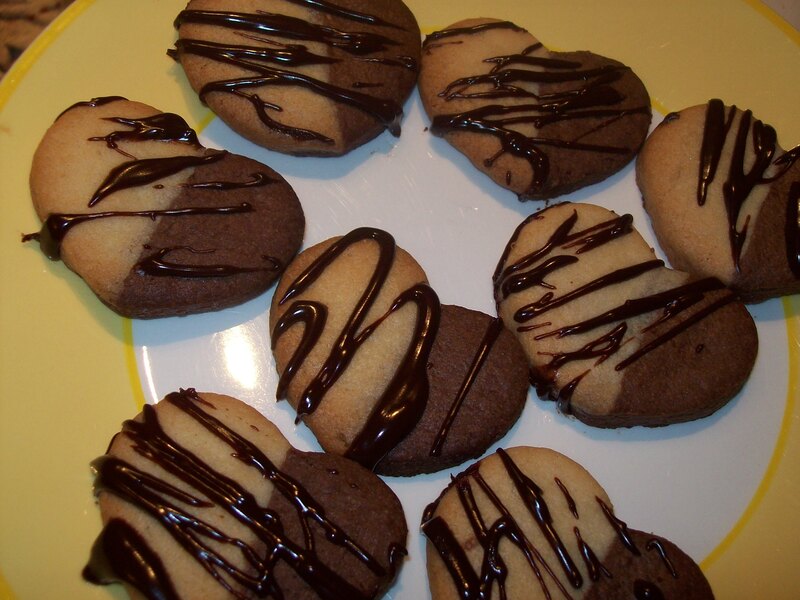 Use a small heart-shaped cookie cutter to cut out the cookies, working down the center seam only, so that each cookie is half chocolate and half vanilla. Lay the cookies on the prepared sheets; gather and re-roll dough as necessary until all the cookie dough has been used. Bake the cookies at 375 degrees for 10-12 minutes or until golden and crisp. Allow the cookies to cool; while they’re cooling, melt the dark chocolate chips in a double boiler over low heat. Gradually pour the cream into the chocolate, stirring, until you have a mixture that will pour from the spoon in a thin, continuous ribbon. Remove from the heat. Dip the tines of a fork into the chocolate mixture, and using a quick back-and-forth motion, drizzle the chocolate all over the tops of the cookies. Let the chocolate set before serving, if you can wait that long. This entry was posted in Cooking, Feeding kids, Parenting and tagged baking, cookies, cooking, family, feeding kids, food, holidays, Household organization, recipes, Valentine's Day. Bookmark the permalink. 5 Responses to Happy Valentine’s Day! You’re welcome! They’re really easy, actually — the only tricky part is getting the two-toned dough rolled properly, but that’s not even very hard. The kids were so excited about these cookies! 🙂 We thought they turned out great! We also made heart-shaped chocolate-beet muffins, which the kids love.